December is finally here, but the 2015 holiday season is a far cry from what it was when I was a youngling. We went from Christmas cards to PicMonkey collages, from 30 minute cooking shows to 60 second Facebook how-to videos, and from “Reindeer of the North Pole” calendars to this dashing fellow. 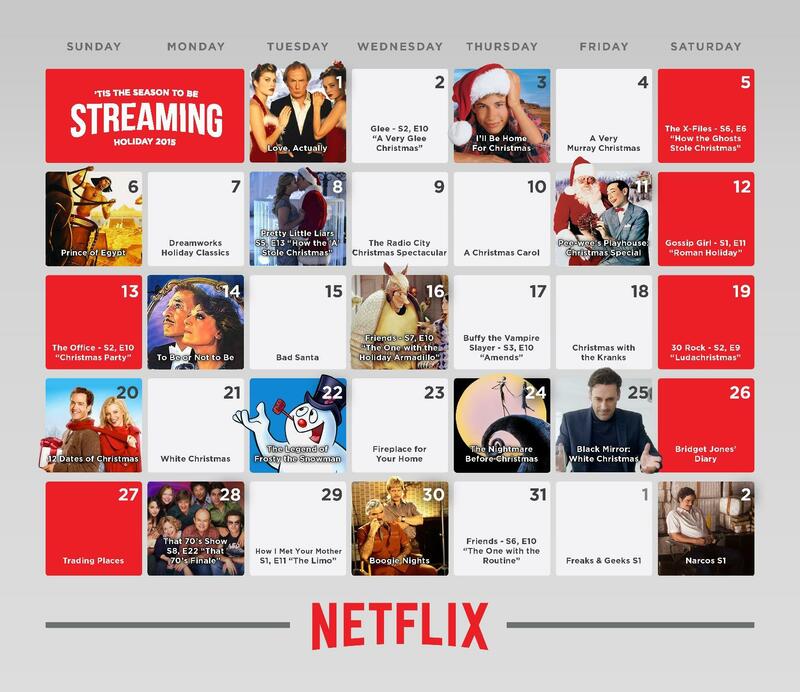 Yup, that’s a Netflix Holiday calendar, and you know what? I love it. Heck, I asked for it. Sorta. I mean, am I good, or am I good? Although several squares in their calendar are completely valid, Netflix missed out on a few TV staples that should be included in everyone’s Holiday to-do list. Poor Leslie struggles during her suspension from the Parks and Recreation department, alongside the stresses and drama of her campaign. But, knowing her passion for gifting, the office prepares something special for her in spirit of the holidays. Lorelai and Sookie host a 19th century themed dinner for the town, and it makes for the coolest Christmas episode of them all. Watching the inn employees try and fail at accents and acting is hilarious, and we get a glimpse at romance between Rory and Jess. Sorry, not sorry, Dean. Season 9 is the very last, which makes this episode particularly special. But the BEST part about this storyline is Dwight as Belsnickel, and how he and Jim realize the importance of spending the day with each other on the brink of so much change. With clashing Christmas parties and telltale Arrested Development antics, Afternoon Delight offers just about everything you could want out of a holiday episode of the cult series. Sibling rivalries, both appropriate and inappropriate family interactions, and the ever-popular banana stand all make an appearance. Another Gilmore Girls addition to the list. Apologies if you’re just not into it, but honestly it’s a tie between the two for best Christmas episode. In Forgiveness and Stuff we have key Luke and Lorelai moments, thresholds crossed for Emily and Lorelai, and that sweet, heartbreaking/heart-filling back and forth between Richard and Emily in the hospital bed. Here we see the gang experience just about every feeling modern 20 and 30-somethings go through around the holidays. Humour, loneliness, confusion, heartache, and wonder fill this fan favorite. Every character has a shining moment in The 23rd, and we end on a high note thanks to the magic of Christmas, and crazy, loving friends.